Gas hydrates are ice-like compounds of water molecules with gases such as methane. They occur in large quantities in the continental slopes of ocean margins. Due to the enclosed methane, they are considered a potential source of energy. Funded by the Federal Ministry of Economics and the Federal Ministry of Research, and coordinated at the GEOMAR Helmholtz Centre for Ocean Research Kiel, the SUGAR “Submarine Gas Hydrate Deposits” project has significantly expanded the basic knowledge of gas hydrates over the past ten years. The project has seen the development of new technologies for gas hydrate exploration, production and associated environmental monitoring. Now the project is concluding with a final conference at the Helmholtz Centre Potsdam - German Research Center for Geosciences (GFZ). Until the end of the 20th century, gas hydrates were considered a rare curiosity. The ice-like compounds of water molecules, including methane and other gases, unintentionally appeared, for example, in gas pipelines. It was not until the 1990s that German and international scientists revealed that the continental slopes on all ocean margins contain large deposits of this substance. In addition to basic research, the question soon arose: can the methane from hydrates be used as an energy resource? Germany's coasts border seas where water depths are too shallow for the formation of gas hydrates. If gas hydrates were to gain economic importance, Germany could only participate in the market as a technology supplier. Therefore, starting in 2008 the Federal Ministry of Economics and the Federal Ministry of Research have been funding the joint academic-industry project "Submarine Gas Hydrate Reservoirs" (SUGAR). After almost ten years, SUGAR is finishing this week with a conference at the Helmholtz Centre Potsdam - German Research Centre for Geosciences (GFZ). “The SUGAR consortium has achieved a great deal during this time. It has significantly expanded knowledge of gas hydrates in the seafloor and developed technologies that are now in demand worldwide,” says project coordinator Matthias Haeckel from the GEOMAR Helmholtz Centre for Ocean Research Kiel. The demand for these technologies is highest in Asian countries. Both Japan and China completed successful test production of methane from submarine hydrate deposits last year. India, South Korea and Taiwan are also very interested in starting their own field tests. Companies from Germany participating in the SUGAR project have been able to develop technologies for environmental monitoring in recent years. These include special echosounders, which can detect methane gas bubbles seeping unintentionally out of the seafloor, or sensors that can measure methane concentrations in the water column. “Even the question of where gas hydrates actually occur and in what quantities, we are able to answer more precisely now than at the beginning of SUGAR. There were major leaps in knowledge in this area, among other things thanks to better computer simulations of processes in the seafloor and high-resolution imaging of the seabed down to a depth of 500 meters,” explains Klaus Wallmann from GEOMAR, who served as coordinator during the first two phases of the project until mid-2014. Another example of technology developed within SUGAR is the reservoir simulator LARS (LArge Reservoir Simulator) at the GFZ. It is a 425-liter steel tank equipped with numerous sensors. In this tank, gas hydrates can be formed in sediments under nature-like conditions. 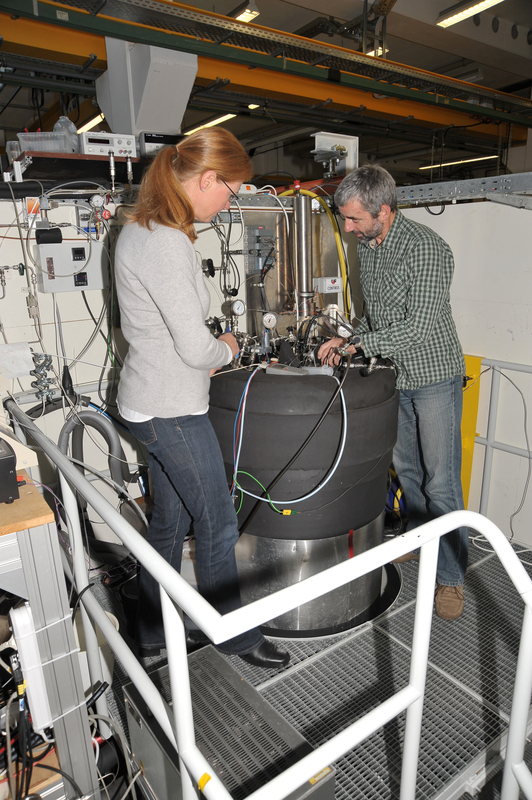 "With LARS we can test various methods for the extraction of methane from natural gas hydrate deposits on a technical scale," says Judith Schicks, head of the working group ‘gas hydrate research’ at the GFZ. Basic research also benefits from such experimental facilities. Even after the end of the SUGAR project, gas hydrates are still interesting for scientists in Germany and worldwide. “Among other things, we want to find out whether they can cause landslides and tsunamis if they are destabilized as a result of ocean warming,” explains Haeckel. In addressing these issues, basic science has benefited from the insights and developments of the SUGAR project. “Better modelling of the seafloor or high-pressure test units for investigating gas hydrate dynamics in sediments will give new insights into the risk of landslides. Mobile drilling technology, developed within SUGAR, allows for cost-efficient recovery of necessary natural gas hydrate samples while retaining ambient pressure,” explains Haeckel. The joint SUGAR project was funded by the Federal Ministry of Economics and Technology and the Federal Ministry of Education and Research, with a total of 31 million euros in three phases (2008-2011, 2011-2014, 2014-2018).